We are writing to ask for your help in supporting our mission to share the stories of and advocate for activists in Vietnam. 2018 has been another difficult year for peaceful political activists in Vietnam. Your support will help us to continue to shed light on their situation in order to protect them amidst heightened state repression. So far in 2018, at least 74 activists and peaceful protesters have been sentenced to prison terms, thirteen of whom were sentenced to more than ten years. Nineteen are females, and 36 were sentenced for “disturbing public order” for largely peaceful protests in the summer. 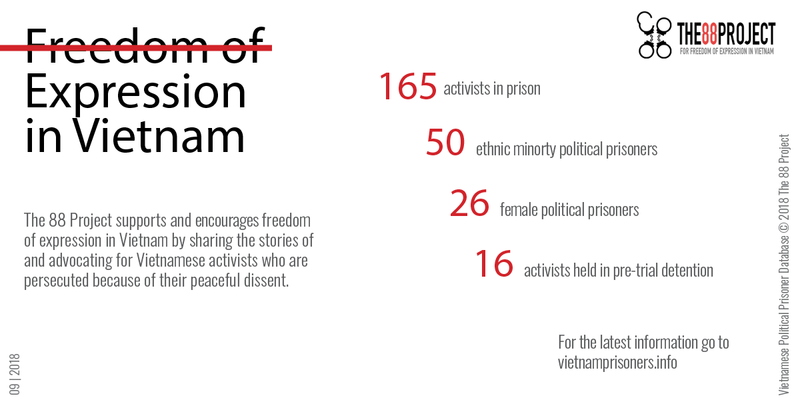 In total, there are 181 political prisoners currently serving a prison term or in pre-trial detention in Vietnam. In August 2018, veteran and environmental activist Le Dinh Luong was sentenced to an astounding 20 years in prison for writing on the Formosa environmental disaster and calling for an election boycott. In October, Luu Van Vinh was sentenced to 15 years for founding a group called the Coalition for Self-Determination for the Vietnamese People, which called for political change in Vietnam. Dozens of protesters have been arrested and sentenced for participating in national protests in June 2018 over draft legislation on Special Economic Zones and Cybersecurity. Authorities also cracked down on a Hien Phap constitutional rights group, arresting several of its members ahead of planned public protests in early September. And just this month, three human rights lawyers were shot at while traveling to work on a trial defending protesters in Bien Hoa City. These are just a few examples of the continued repression of civil society groups and individuals in Vietnam. While we celebrate that blogger Nguyen Ngoc Nhu Quynh, human rights lawyer Nguyen Van Dai, and pro-democracy activist Le Thu Ha were all released early from prison in 2018, many more, like Tran Thi Nga (migrant labor advocate sentenced to nine years) and Tran Huynh Duy Thuc (blogger and pro-democracy leader sentenced to 16 years), remain behind bars with years left to serve in their sentences. Your donation will make it possible for us to continue informing the public about these activists and political prisoners through our weekly newsletter, website, and Vietnam Political Prisoner Database. In the database, we dive deep into the backgrounds and details of imprisonment of dissidents to provide a full picture of their lives, motivations for activism, health in prison, and information that can be useful for advocacy efforts. This summer, Human Rights Foundation was able use data about female Catholic activist Tran Thi Xuan from our research to submit a complaint to the UN Working Group on Arbitrary Detention on her behalf. Also, just this month, the European Parliament filed a motion for a resolution on the situation in Vietnam, specifically with regards to political prisoners, in which they referred to our database for up-to-date information about prisoners. In 2019, we are going to expand our database to include activist-at-risk profiles, apart from political prisoners, and produce interviews that will highlight female activists. We are also redesigning our website to include a map of human rights violation incidents by localities, as well as other features to share more in-depth information on human rights news in Vietnam. With your help, we can continue to keep the stories of activists and prisoners in the news and on the minds of people with the power to press for change.